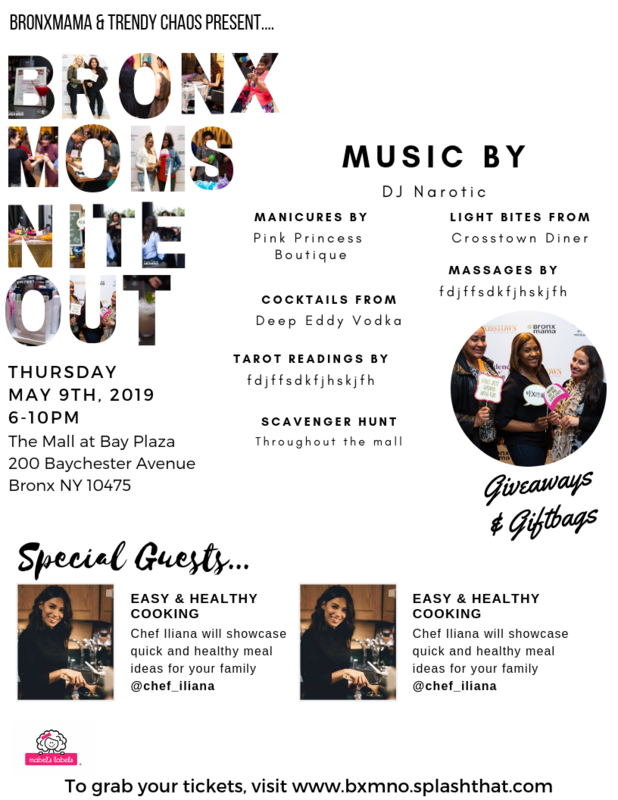 Grab your sister, girlfriend, and mom friends and join Bronxmama and Trendy Chaos for a fun evening to celebrate National Mom's Nite Out. Join us at the Mall at Bay Plaza for appetizers, drinks, music, manicures, brow clean up, massages, tarot readings*, live demos, and socializing with friends,shopping, giveaways and swag bags! Mom's Nite Out the Bronx is presented by NYC Ferry. Visit them anytime throughout the evening to plan your next ferry adventure! DJ Narotic joins us once again as he sets the tone for the evening with a mix of old school beats for everyone to move their feet. Unwind from a long week and leave the kids at home. Indulge in conversations with old friends and new. Pick your polish and enjoy a manicure and learn more about Pink Princess Nail party packages for kids. Fetish Brow and Beauty Bar will be offering brow cleanups and complimentary consultations. They will also offer discounts on brow, lash, and laser treatment services booked during Mom's Nite Out. Enjoy back massages throughout the evening courtesy of Soothe. Get ready to get motivated and get your life organized with apartment Jeanie. Jeanie is a lifestyle curator, interior stylist, chaos conqueror helping you #livebetterorganized. Jeanie goes wherever clutter & poor design lurk. We are happy to have her with us to cleanup our motherhood act. Join Chef Iliana as she talks delicious and healthy food!. She'll be demoing a healthy meal idea and will be on hand throughout the night to answer any recipe or meal prep questions you might have. Join Macy's for a special Master Class Make-Up Session. Learn some new looks for summer and some tips and tricks! Celebrity stylist and owner of Hair House Dana Fiore will be giving a fun beach wave demo just in time for summer. Colorist and texture specialist Kay will also be on hand for color consultations throughout the evening. There will be some awesome raffles throughout the night so be sure to listen to the DJ as your name could be called! Shop til you drop! Participating stores will have special discounts, activities, and more! Event photos will be taken by Photos by JonB, be sure to smile for Jonathan, he will share all pictures with us and you after the event! Please place your name and email in the notes and we will respond with your ticket information. PLEASE NOTE TICKETS WILL NOT BE SOLD AT THE DOOR!